Can monitor emulation plugins replace the need for referencing on multiple systems? 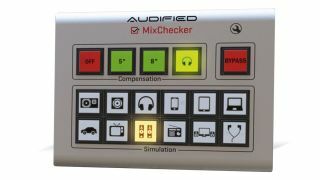 Audified MixChecker simulates a range of different playback devices. The idea behind monitor emulation plugins such as Audified MixChecker and Toneboosters Isone is to give mixing and mastering engineers the ability to hear how their tracks sound on a range of playback systems, from mobile phone and tablet speakers to home hi-fis and beyond. "Yes, but it's necessary to keep in mind that the fidelity of the software model is strongly dependent on the quality of the monitors you use in your studio. You cannot expect a plugin to turn mid-priced monitors into the most accurate ones. "On the other hand, when it comes to simulation of reference devices that are below the quality of your studio monitors, the answer would be 'absolutely yes'! "We could create an exact model of a Sony Xperia Z3 or a Philips 40PFT5500/12 TV set, but such a plugin would help only those who want to mix for those particular devices. There are thousands of device types on the market, so we believe that creating 'average' models of consumer devices with easy controls will help mix engineers much more than having a completely true model of a single device with dozens of settings." "Theoretically, yes. By using monitor emulation plugins you can see how your mix might translate on different systems. However, these emulations should be applied on already-calibrated systems (or be used in a perfectly flat room on perfectly flat monitors), otherwise you will not get accurate results. To be effective, speaker emulation plugins need to have a way of knowing what the frequency response of your system is." "Monitoring speakers differ significantly in the way they spread audio into the room. This 3D radiation pattern is specific to a certain monitoring loudspeaker design. Signal processing can modify large deviations in sound colour, and add some nonlinear (distortion) characteristics, but directivity is beyond the reach of signal processing software. "A mix checking plugin, while it can increase your understanding of your mix's content, will never be able to reliably model any specific high-quality monitoring loudspeaker or be able to transform one monitoring loudspeaker into another." "In a mixing or mastering session, these tools can provide value because they allow mixers to quickly evaluate how their current work translates to different speaker setups and environments. Potential issues with a mix can be revealed much more easily and efficiently than ever before, and that benefit was one of the main drivers to develop our Toneboosters Isone room and speaker simulation plugin. "Whether the current state of binaural technology is sufficiently accurate to completely eliminate the need for speakers is questionable, I think. Models are always simplifications of the real world by definition, but they definitely serve as a valuable tool."